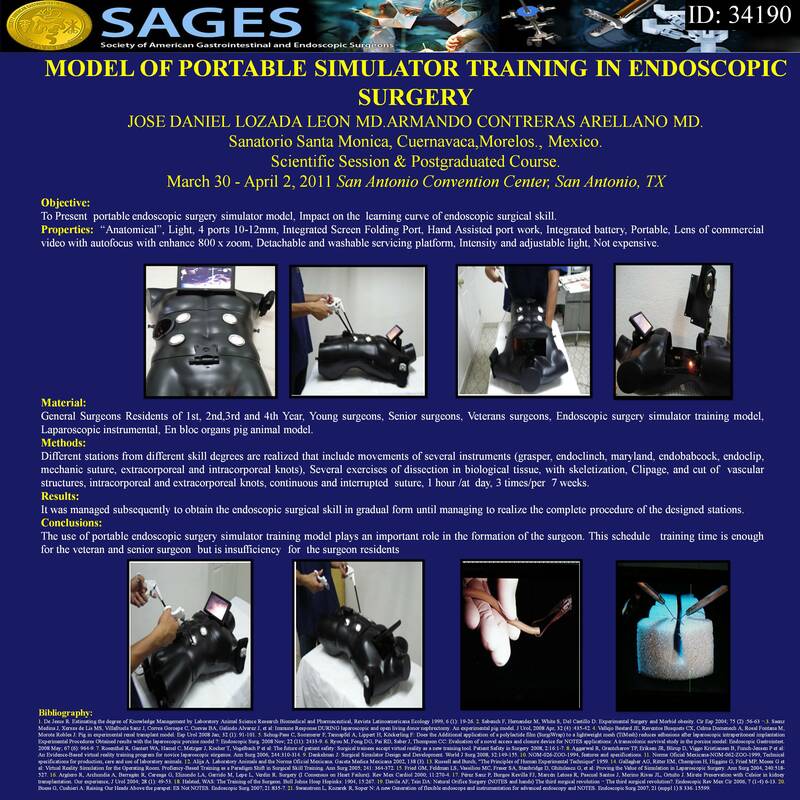 Objective: To Present a portable endoscopic surgery simulator model, Impact on the learning curve of endoscopic surgical skill. Properties: “Anatomical”, Light, 4 ports 10-12mm, Integrated Screen Folding Port, Hand Assisted port work, Integrated battery, Portable, Lens of commercial video with autofocus with enhance 800 x zoom, Detachable and washable servicing platform, Intensity and adjustable light, Not expensive. Material: General Surgeons Residents of 1st, 2nd,3rd and 4th Year, Young surgeons, Senior surgeons, Veterans surgeons, Endoscopic surgery simulator training model, Laparoscopic instrumental, En bloc organs pig animal model. Methods: Different stations from different skill degrees are realized that include movements of several instruments (grasper, endoclinch, maryland, endobabcock, endoclip, mechanic suture, extracorporeal and intracorporeal knots), Several exercises of dissection in biological tissue, with skeletization, Clipage, and cut of vascular structures, intracorporeal and extracorporeal knots, continuous and interrupted suture, 1 HOUR / DAY, 3 TIMES/WEEK, 7 WEEKS. Results: It was managed subsequently to obtain the endoscopic surgical skill in gradual form until managing to realize the complete procedure of the designed stations. Conclusions: The use of portable endoscopic surgery simulator training model plays an important role in the formation of the surgeon.